Havok™ AI, a cross platform SDK to perform navigation mesh generation, pathfinding and path following in highly dynamic game environments. Havok™ Animation, an animation SDK and tool chain that provide optimised playback and real-time blending on current and next-generation game systems. 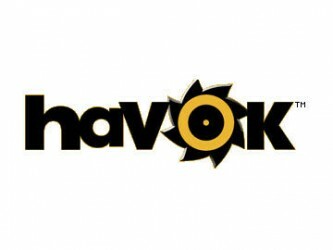 Havok™ Behavior, an intuitive composition tool for artists and designers, and a run-time SDK for game programmers. Havok™ Cloth, a runtime and toolset that allows character designers to go beyond simplistic tight-fitting or hand-animated clothing, and to add believable, physically-based motion to garments. Havok™ Destruction, gives the game artist total control over the simulation of rigid body destruction, drastically reducing the production time and cost of creating large numbers of believable destructible game objects. Havok™ Physics, provides real-time collision detection and physical simulation solutions. Havok Script™ , a Lua-compatible Virtual Machine designed for console game development that ships with Havok Script Studio, an integrated environment for Microsoft Visual Studio and on-target profiler.